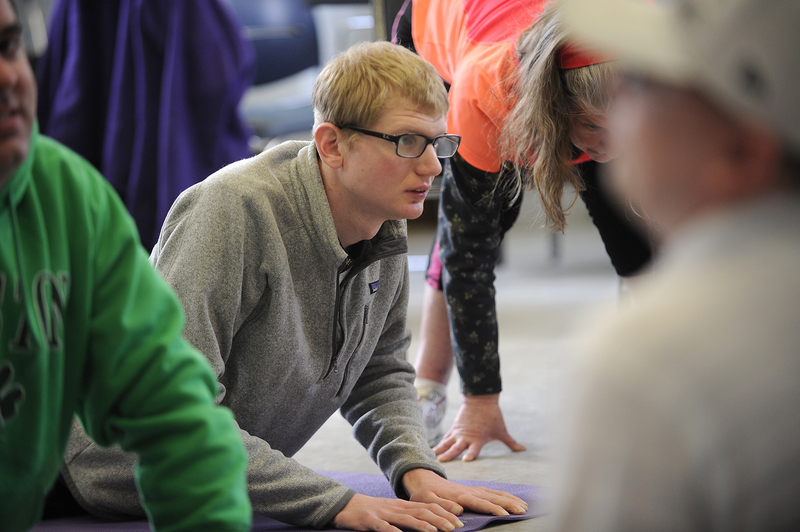 Billy Mariscal, 22, participates in a yoga class at the Charles River Center in Needham on Tuesday, Mar. 31, 2015. Over the last month-plus I’ve taken a look at special education in Wellesley, from out-of-district placements and the challenge it can sometimes be to obtain them to their impact on the town’s budget. Later, we focused on what life is like for people with special needs after they age out of the public school system at 22. It’s a situation with outcomes that can often be satisfactory but, by the very nature of the circumstances, can never be perfect. Wellesley’s school officials will ask Town Meeting for a supplemental funding of over $400,000 to make up the difference between their expectations at this time last year and the reality of their budget situation now. The largest individual driver of that disparity, officials said, is the unpredictability of special education costs that in the most recent budget year accounted for nearly one third of the district’s $64 million-plus operating budget. School districts are required to provide what’s referred to legally as a Free Appropriate Public Education (FAPE) for all of the children in its jurisdiction. To meet that goal, Wellesley has developed multiple programs within its own borders that are meant to include students with their peers while giving them the specialized attention that they need. Approximately 900 of Wellesley’s public school students are on an Individualized Education Plan (IEP), according to Lori Cimeno, the district’s director of student services. Those plans, she said, are negotiated between the district’s team of professionals and parents. The IEP, Cimeno said, functions as a contract between the district and families and can require services ranging from offering a student extra time on a test or more attention from a tutor to—in the most severe of cases—a placement in a residential care and educational facility out of district at a cost of hundreds of thousands of dollars each. Superintendent David Lussier said that he and his colleagues are looking into ways to ease the strain placed on the district by special education costs. Along with state aid that offsets some of the cost of sending kids out of district, Lussier said the district would look to the federal government and a six percent reimbursement via Medicaid that’s allowed under federal law. That, he said, could ease the strain placed on the budget by special education. Town Meeting last year budgeted just over $18 million for special education costs. That number, which includes some cuts without any strategic plan investments, will jump to $19.6 million in the upcoming fiscal year if Town Meeting approves the budget as is. Cimeno said the district has placed an average of 66 children outside of the district in specialized schools over the course of the last few years, with a handful in residential facilities. The decisions on those placements, though, are sometimes a source of conflict for districts and parents.